The IPMI Online Buyers Guide is the best way to keep your finger on the pulse of technology in the industry. If you’re looking to find product and service providers, this resource puts you in the driver’s seat. Buyers can count on IPMI’s interactive online directory to source consultants, commercial operators, suppliers, distributors, and more of the products and services they need to successfully operate their businesses. Industry suppliers can list their company information and products annually and feel confident they are reaching targeted audiences through IPMI’s global community. The interactive IPMI Online Buyers Guide provides members and other industry professionals with a more interactive search tool that offers quick access to a more extensive directory of industry-specific products and services. Check out the new IPMI Online Buyers Guide here. Interested in advertising? Email IPMI@IndustryVantage.com. Questions? 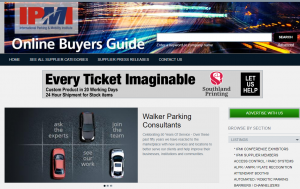 Email us at IPIBuyersguide@parking-mobility.org.